Q. Before surgery should I take my medications that I usually take? A. It is best to check with your surgeon prior to surgery to see if you should take your medication. You can also call the facility where you are having surgery and talk to one of the nurses. Q. What about herbal medications or supplements? Are they okay to take before surgery? A. It is best to stop taking herbal products 2 weeks before a scheduled surgery. Tell your surgeon and anesthesia provider what you have been taking or have taken recently. If you are not sure about what you are taking bring the product in its original container and show it to the anesthesia provider. Learn more about herbal supplements and anesthesia. Q. What kinds of problems do herbal products cause? A. Some of the possible problems that herbal products may cause are increased bleeding, heart and blood pressure changes and changes in how the body reacts to anesthesia medications. Known herbal products that may cause problems with anesthesia are: ephedra, feverfew, garlic, ginger, ginseng, kava and St Johns Wort. Q. My doctor has recommended robotic surgery. What should I know? Q.What are my options for anesthesia and control of pain after surgery on my leg or arm? 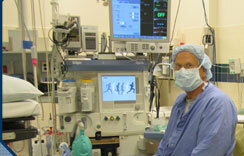 Copyright 2013 Anesthesia Services of the Fox Valley, SC. All rights reserved. For information regarding bills call: (920) 426-2211-Medical Resource Management.